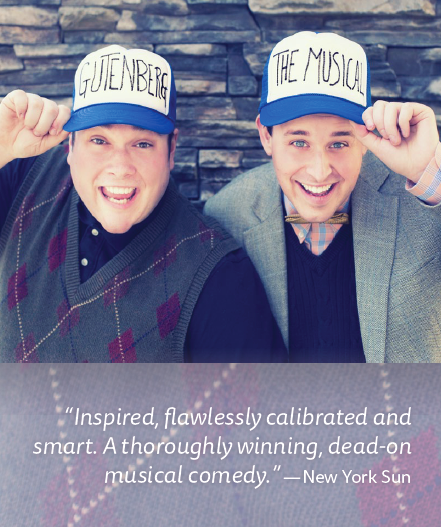 In this whirlwind musical comedy and two-man spoof, Chris Adams and Erik Gow play over 30 characters. A pair of aspiring playwrights perform a backers’ audition for their new project—a splashy musical about printing press inventor Johann Gutenberg. With an unending supply of enthusiasm, Bud and Doug sing all the songs and play all the parts in their crass not-entirely historically accurate epic musical, in hope that one of the producers in attendance will take them to Broadway—fulfilling their ill-advised dreams. Chris Adams, a UVIC grad, has performed in some of the greatest theatres across Canada including The Globe in Regina, The Centaur in Montreal, and Vertigo in Calgary, and has produced over 10 musicals over the last 5 years. Gutenberg! The Muscial! marks the 11th musical Chris Adams has produced over the past 5 years. Erik Gow, a Studio 58 grad, and a performer/teacher/multi-instrumentalist, has worked with such companies as The Arts Club, Gateway Theatre, TUTS, Chemainus Theatre Festival, Axis Theatre, and many more. This professional dynamic duo has come together under the guidance of Axis Theatre’s Chris McGregor to present Bud and Doug’s ode to Broadway. A master in physical comedy, McGregor brings years of experience and has directed over 100 shows across Canada.